After launching the Honor 8 smartphone in China and USA, Huawei has finally launched the smartphone in Europe. The Honor 8 will cost €399 ( for 32 GB storage model) and €499 (for 64 GB storage model). If you live in the UK, you’ll have to come up with £370 for the cheapest version. Huawei’s mid-range smartphone is already available for pre-order via company’s online store. It will soon be out in Russia and the Middle East for those who want it. 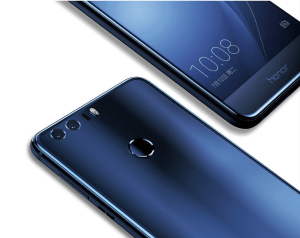 The metal and glass phone features a rear mounted fingerprint scanner, which the company claims will unlock the device in 0.4 seconds. The finger print scanner on the device is also a “smart-key”. You can program it to open specific apps or to take photos, depending on how many times or for how long you press it. 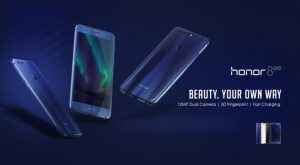 The Huawei Honor 8 features a 5.2-inch AMOLED 1080p display and is powered by a 2.3 GHz octa-core processor that comes with 4 GB RAM and 32/64 GB internal storage options with a micro-SD slot for further expansion up to 256 GB. The smartphone comes with Huawei’s own Kirin 950 chipset as its processor and runs on Android 6.0 Marshmallow OS. The Honor 8 has two 12 mega-pixel rear cameras, one of which captures the image in RGB (color) while the other captures the image in monochrome. The two are processed simultaneously to create one photo, a supposedly better pic with more detail. Interestingly, the cameras are not branded Leica as they are on the P9, though they appear to be a very similar setup (unfortunately no OIS (optical image stabilization) on Honor 8 cameras). The smartphone also features an 8 mega-pixel front camera. The Honor 8 is backed with a 3,000 mAh battery that supports fast charging and USB Type-C port. The company claims that the phone will give two hours of phone-call time for a 10-min charge. Honor 8 can charge to 47 per cent in 30 minutes.